Chapter 8 of the book "The War in Panay" by Jose Doromal starts out with the month of November 1942 on page 35. On December 15th, the Airbase Squadron was created under Major Henry W. L. Meider, AC, to take charge of airbases on the island. This unit, together with the Corps Engineers section, absorbed most of the American officers who reported to Peralta for duty. Doromal appears to have placed this part in the wrong year. The Airbase Squadron was created under Meider in December 1941, not in December 1942. When the Japanese bombed Iloilo City for the first time on December 18, 1941, all planes of the locally operating airline INAEC (Iloilo Negros Air Express Company) was lost, except for Meider's Bellanca aircraft. With the airline's equipment and base destroyed, Meider sets out to organize the INAEC personnel into an "Air Base Squadron." This squadron began operating in January 1942. Also in January 1942, mining engineer Claude Fertig was called to active service in Panay from Masbate. He subsequently brought along his fellow American Masbate mining engineers to Panay and finds them work with the Philippine Army. Claude was made the island's airfield officer and tasked to build airfields for fighters in Panay, in support of bomber planes from Mindanao. He assigned his fellow miners to supervise the work on the airfields. The Philippine Army gave them the ranks of major. At this time, the Philippine Army in Panay was still intact. The Japanese hadn't invaded yet, and the guerillas under Peralta had not yet been organized. With the Masbate engineers' supervision, the Airbase Squadron began building airfields, and was able to finish three, including Cabatuan Airfield in Barrio Tiring, Cabatuan, Iloilo. 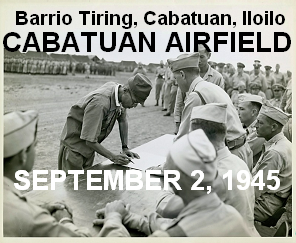 Cabatuan Airfield became operational on February 1, 1942. It was used by the Americans until the Japanese finally invaded Panay on April 16, 1942. The Japanese forces then operated it from the time they arrived until they retreated to the mountains in 1945. This airfield in Cabatuan was called the Cabatuan Airfield by the Japanese Imperial Army, after the town of Cabatuan, Iloilo where it was located; Tiring Landing Field by the Panay guerillas of Col. Macario Peralta and the Free Panay Government of Iloilo Governor Thomas Confesor, after Barrio Tiring, Cabatuan, where it was specifically located; Tiring Airfield and Tiring Field by the Americans, after Barrio Tiring, Cabatuan; and erroneously as Santa Barbara Airfield or Santa Barbara Airport by the Americans, erroneous since the airfield was not located in the neighboring town.